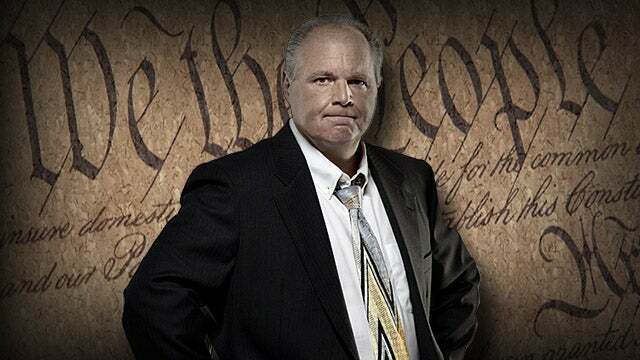 RUSH: Donald Trump says that the Democrats are getting very strange. You see where Trump tweeted last night? "Democrats are getting very strange. They now want to change the voting age to 16. They want to abolish the Electoral College and increase significantly the number of Supreme Court justices. Actually, you've got to win at the ballot box." Now, I know Trump is being facetious. But the Democrats do want to lower the voting age, and they do want to get rid of the Electoral College in order to win at the ballot box. Mitt Romney would have been Obama in 2012 if we only counted the votes of people over 30. Everyone younger has been completely indoctrinated by the schools or, as Pelosi says, they've been captured. Let me run through the list of things here that the Democrats want to do. And all the while they are running around talking about how Trump is assaulting the norms in our country, that Trump is assaulting our cultural norms, Trump is assaulting our political norms, that Trump is blowing up everything. It's the exact opposite. It is the left today that is assaulting American norms, if you will. Court packing? Abolishing the Electoral College? Abortion after birth? Open borders, anybody wanting to come into the country gets in? The government totally taking over health care, Medicare for all. You think that's not assaulting norms? Everything the Democrats want requires trampling on the Constitution. I'm gonna tell you something else. 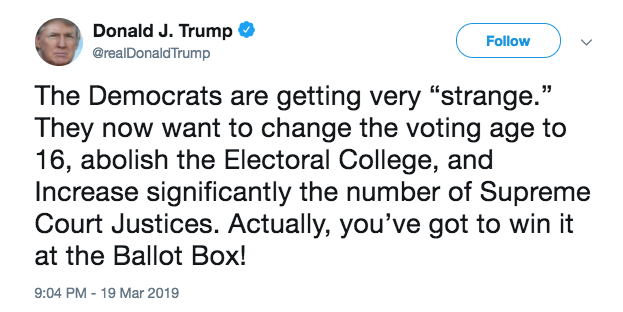 This business of getting rid of the Electoral College in order to make every vote count, what a silly and stupid claim. Let me present a picture for you. Once there is no Electoral College, if they were to ever succeed in eliminating it, and they want to do all this without going through the amendment process to change the Constitution. They just want to decree it! This is modern-day liberalism. They decree climate change is real and that's it, there is no debate. They decree that eating meat must be stopped. There's no debate. You must stop eating meat. Whatever cockamamie, crazy thing they want, they are demanding it, including changes to the Constitution. No debate, no argument, and you don't get a say. But let's paint a little picture here. I don't know that people, with the state of American education today, I doubt that very many young people have the slightest idea the purpose of the Electoral College. They don't understand the concept of representation in the House of Representatives versus each state getting two senators, regardless of size. They don't understand any of this because they've not been taught this. But it is fundamental to understanding how a constitutional representative republic works. But let's play the little game. Let's say there is no Electoral College. If there's no Electoral College and the only thing that matters is the popular vote, guess where presidential candidates are not going to campaign? Red state flyover states. Those states will never see presidential candidates come to town. Presidential candidates will go to New York, they will go to California, they'll go to Illinois, they'll go to Texas, maybe Florida and Ohio, and outside of that, they won't go anywhere because it won't matter. Is that what you want? You want all of these red states, flyover states that do not have separately and individually large Electoral College votes, you want them wiped out, only the popular vote counts, guess where the candidates are gonna be? The Left Coast and the Right Coast and Texas. That's all they're gonna do. New Jersey, New York, Connecticut, Boston, Massachusetts, that's the only place. And those people are gonna be the ones that then will elect the president of the United States. This is exactly what the Founding Fathers intended to prevent! The Electoral College is the equivalent of equal representation. Let's go back and look at 2016. We are told -- and we'll just accept this for the sake of the discussion -- we're told that Hillary Clinton won the popular vote by three million votes. But she lost the presidency by a significant number of Electoral College votes. Her margin of victory of three million popular votes was a combination of New York and California. Trump did not even campaign in California. Trump didn't think there was any reason to. There was no reason to waste money in California, no reason to waste time. He spent a little time in New York, since he lives there, but he didn't go because it's lost. The Democrats own it. They gonna get all the electoral votes there so he didn't go. If Hillary Clinton had won the presidency on the basis of the popular vote, I dare say that the people that would have elected her would have been in California and New York and New Jersey and Massachusetts, Connecticut, and so forth up and down the East Coast. Well, forget the mid-eastern seaboard, mid-Atlantic states, gotta include on Florida. That's exactly the opposite of what the Founding Fathers intended. Now, these people that want to ban the Electoral College, whether they know this explicitly or instinctively, they still understand what they're talking about. They want to eliminate your say-so in the presidential race. They can't win. This has been my point all along. They can't win without gaming the system, in their own minds, they're admitting it. They don't think they can win without gaming the system. Now they need to game the Constitution. The same way with representation versus the House and the Senate. In the House, members are elected every two years, and they represent districts in the states, and it's directly related to population. So California and New York have larger congressional delegations in the House, but each state only has two senators, so every state is represented equally in the Senate to counter whatever out of balance occurs by direct representation in the House. The Founding Fathers wanted to make it very hard for government to function. They built gridlock into the system like you can't believe because they didn't trust what they knew would be the amassing and collection of massive political power in the nation's capital, in Washington. They never wanted to take power away from the people who live in the country because it is a country of, by, and for the people. And so they built a system with checks and balances and everything else to really make it tough to pass new laws. Why do you think the administrative state has sprung up? Because it is tough to get legislation passed in Congress. And the longer and longer we go, we discover that Congress doesn't even want to tackle controversial issues because they don't want go on record voting pro or con because then that becomes a hindrance to their reelection campaign. So they form blue ribbon committees, for example, to determine which Air Force Bases are gonna be closed during downsizing or this or that. So that when it comes time, say a couple bases close in California, the local congressman can say, "Hey, hey, hey, I had nothing to do with it. I worked really hard to save the base, but that blue ribbon panel, they're the ones that did it. Don't look at me." Same thing with the administrative state. All these laws, all these regulations that come from unelected people way deep in the administrative state because it got really hard for the left -- well, anybody -- to really move an agenda forward in the House and the Senate and to get a presidential signature. It was designed to be really hard. It was designed by the founders for government not to have an easy time wielding power over people and growing and getting bigger. And as the country evolved it became harder and harder for legislation to happen, ideologues and agenda-driven members of Congress and the Senate expressed all this frustration. So here comes the deep state and all these presidential cabinet level departments. And how many of them did Nixon create? Nixon gave us OSHA, Nixon gave us the EPA, all in an attempt to buy the love of liberals -- and it didn't work. So we build all these bureaucracies. They become part of the administrative state. They start issuing regulations left and right. They've been doing this for the last 50 years. We have no recourse. We don't even know when it happens. We don't even know when stuff is being debated. It isn't being debated. It's being decreed. This is not how it was designed to happen. Yeah, let Trump come out in favor of it and start nominating a bunch of Neil Gorsuches and see how they feel about it. Abolishing the Electoral College? I'm telling you, folks, stop and think about that one. This talk about the popular vote should elect the president? Yeah, if every state had the equal number of people in it. But it doesn't. If the Democrats and Republicans were equally represented in every state then, yeah, you could talk about it. But that's never gonna be the case. And I'm just telling you: If you get rid of the Electoral College, there isn't a presidential campaign that's gonna spend any time outside of the Left Coast and the East Coast whatsoever. People in New York, Boston, New Jersey, San Francisco, Seattle, Los Angeles, San Francisco, and Silicon Valley are gonna elect every president if you get rid of the Electoral College. RUSH: Now, all of this that I just explained to you was hashed out at what's called the Great Compromise, and it was part of the Constitutional Convention in 1787, and the Great Compromise is what resulted in the structure of the House and the Senate and eventually the Electoral College, and it was all based on some representation being based on population, while others wanted it equal. So it was decided that each state would get two senators -- meaning that in that body, no state had any more power than any other, regardless of the population. It transferred to the Electoral College. Wyoming has only three electoral votes, for example. But that is a far more powerful number. Three, as part of the whole Electoral College, is a much greater number than is the population of Wyoming compared to the population of the country. What is happening now is that liberal Democrat states, realizing the futility of eliminating the Electoral College, are now coming along and wanting to alter their election law by saying that the popular votes in their state would guarantee all the electoral votes in their state, and that the electoral votes in their state would reflect the popular vote nationwide. Colorado has joined this effort. It's "the first swing state to join a group pledging to elect presidents based on who wins the national popular vote." So the left is attempting to undermine the Constitution in so many ways, and yet they accuse Trump of assaulting our national norms.